It's all about putting heads on beds! At Longbotham, we've been involved with hospitality and tourism marketing for decades. Clients include tourism organizations, attractions, 4-diamond resorts, bed and breakfasts, country inns, destination properties, hotel franchises and restaurants. We understand the nuances of creating sales and marketing materials that successfully cater to the differing needs of FITs and group travel professionals. Scroll down to see a few different examples of our work. 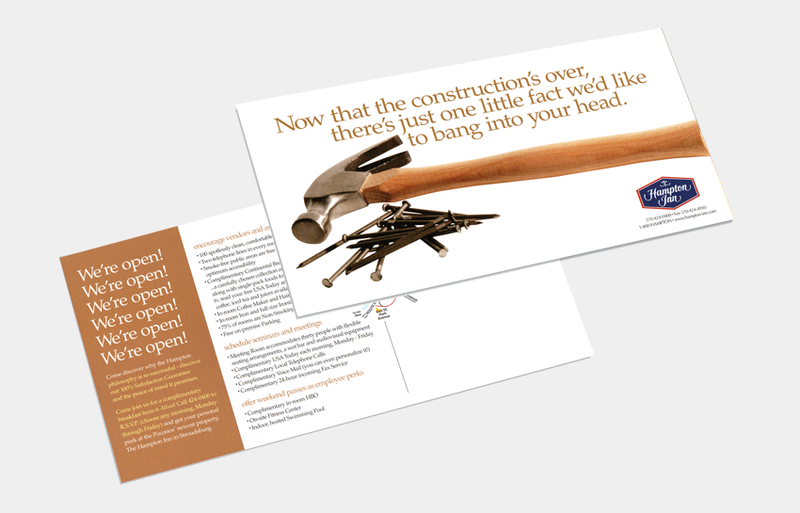 When a new Hampton hotel was being built along Route 80 in the Poconos, the owners brought us on board to get started on a hospitality marketing plan before the sawdust had even settled. To attract the traveling public, bus groups and the regional business community, we took a proactive approach using traditional media, direct mail, motorcoach trade shows, fam tours and receptive operator incentives. With the Holidays fast approaching, The Inn at Nichols Village decided to bolster occupancy by appealing to more than just weary travelers. 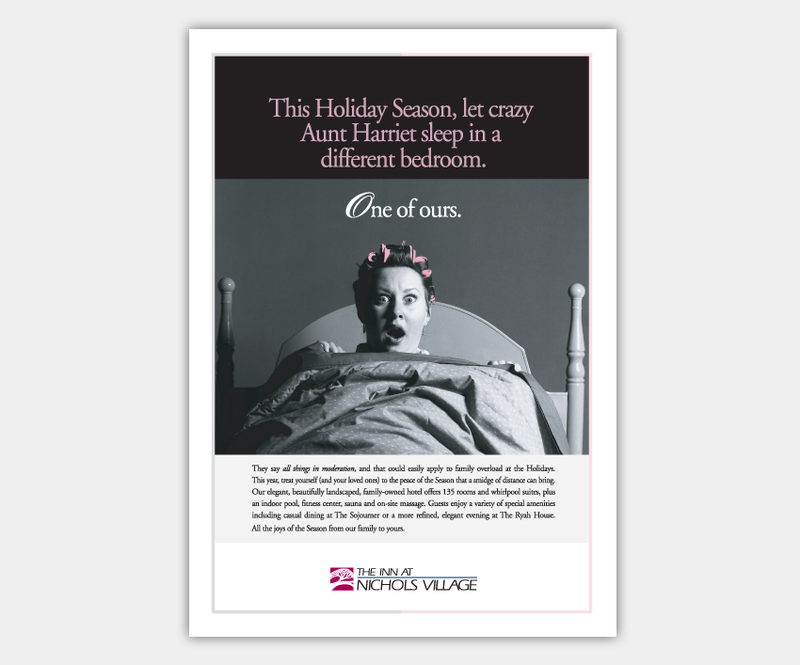 This ad reflects the driving creative theme in a hotel marketing campaign that invited local residents to host visiting relatives at Nichols Village, instead of in their own homes. In addition to print advertising and radio commercials, we used posters, table tents, brochures and banners to cross-sell the concept around the entire property, throughout multiple buildings and in two on-site restaurants. With its legendary hospitality, Ye Olde England Inne is one of Stowe, Vermont's most famous stops for comfortable lodging, eclectic dining and good, old-fashioned cheer. Our challenge? 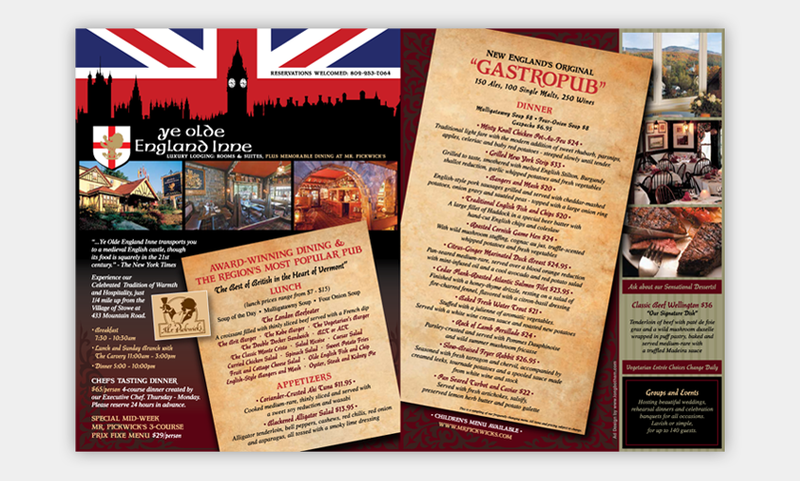 Design a double-truck ad for the region's premier destination marketing publication that effectively captured the spirit of the Ye Olde England Inne experience. Contrasting bold English colors with rustic textures and fonts yielded an apt reflection of the unique richness and warmth one would enjoy during any quick stopover or lengthy stay.